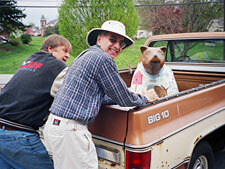 Principal Ron Christman assists Paul Stahl load Gilbert onto the Dada Truck on his wear for clearcoating. 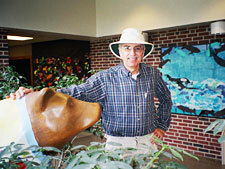 Gilbert watches over the students as they pass by his post. What a happy-looking team taking good care of students at GES. 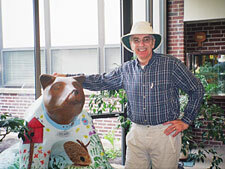 The courtyard at Gilbertsville Elementary School is a great site for their beautiful bear. Principal Ron Christman and Gilbert strike a happy pose. 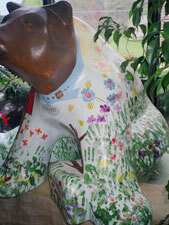 “Gilbert” is proud to display the work of more than 800 students and 85 staff members in his design. The handprints of 2005’s sixth grade students were “collected” before their move to junior high. 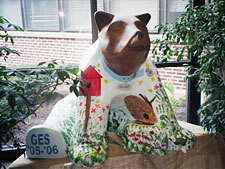 During the 2005-2006 school year, every single student and staff member of GES contributed his or her fingerprint or handprint to create the springtime scene which adorns Gilbert’s body. 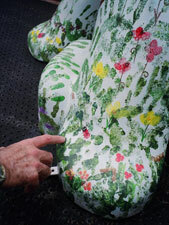 You’ll find an assortment of colorful spring flowers and tiny creatures—bees, ants, a praying mantis, a frog, for example—featured on Gilbert’s body. And, if you look closely, you will also see the first names of every student and staff member written along the stems of the flowers. Mr. Christman is also pleased that two parents stepped up to coordinate the task. 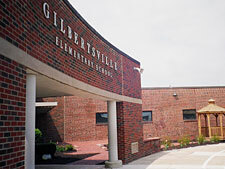 Maribeth Huber and Joanne Santoliquito had the vision for Gilbert and nurtured the project to its beautiful conclusion.